Sure, it may be one of the most clichéd travel photos you can take, but the iconic pose holding up the Leaning Tower of Pisa—or, alternatively, pushing it over for the more diabolical visitor—is a fun, whimsical shot for anyone traveling through Tuscany. An easy day trip for those staying in Lucca, or a quick stopover between the Cinque Terre and Florence, Pisa is one of the most important cities in Tuscany and home to a number of historic churches and museums, and one of Italy’s most esteemed universities. By far the city’s most famous sight is the Cathedral’s bell tower, located in the Piazza dei Miracoli just north of the old town center. The campanile began to list shortly into its construction in 1178 due to instability under its foundation, and has been leaning precariously for almost a millennium. 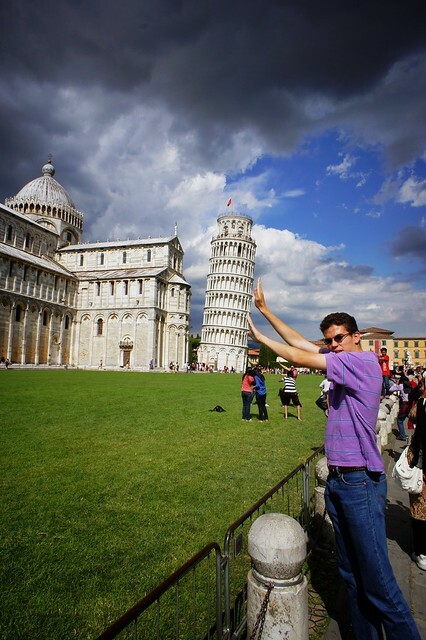 The iconic pose holding up the Leaning Tower of Pisa is a fun, whimsical shot for anyone traveling through Tuscany. Click to tweet. Recent efforts by engineers to stabilize the tower have been partially successful, and the tower has straightened by about an inch over the past decade. So if you’d like to get your iconic picture taken, you may want to hurry. At the current rate, the Leaning Tower of Pisa will no long live up to its name in just, um, 214 years.